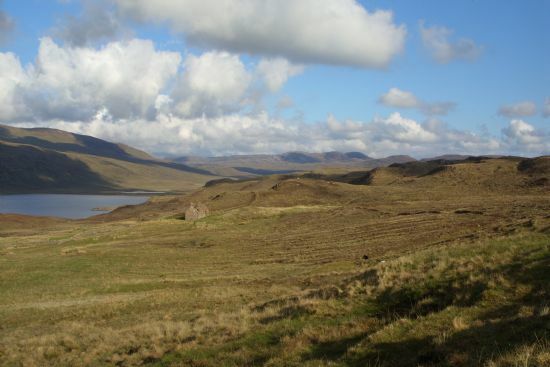 This building is situated on an eastward facing slope above Sandwood Bay and to the west of Sandwood Loch, this and adjacent structures form part of a wider, multi-period cultivated landscape. 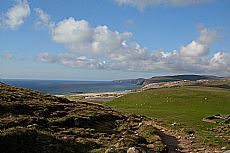 Click on the photos for a close up view of Sandwood House, Sandwood Farmstead and sheep pens and a view out over Sandwood Bay! The site is located on a man made terrace, cut into the slope, providing a large strip of level land upon which to build. The building dates from the latter half of the 19th century and was utilised as a farmhouse, replacing the earlier 19th century longhouse-style farmstead 200m to the northwest. It is a symmetrical, stone built structure, approximately 10.3 by 5.2 m in plan, the entrance is located on the eastern side of the building. Although roofless, most of the building remains upright and in a reasonable state of repair, (most of the walls are still standing above head height). Substantial lintels top the entrances and windows and externally the corners and doorjambs retain partially dressed quoins. Joist socket holes evident in the east and west walls demonstrate where an upper floor would have been. The southern gable end has had an annex built against it; this is still roofed and extends the building by 4.3m, but has no evidence of an upper floor. The stone walls of the annex have been coated with cement externally, perhaps to help it retain its stability. 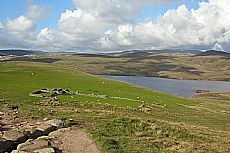 The site is located within an immediately apparent cultivated landscape above a network of 19th century drystone dykes, delineating the extent of the more modern field boundaries and cultivation areas. To the northwest of Sandwood House the remains of small sheep enclosures are still extant to the north of the old longhouse-style farmstead, demonstrating that the area has also been used for pastoral means. These sheep pens are integrated with a shepherd’s cottage, all of which are drystone construction. A small rectangular feature 16 by 11m with low turf covered walls between Sandwood House and the earlier farmstead is a likely pre-improvement farm and adjoining kale yard. On the higher ground there are very clear regions of rig and furrow cultivation and pre-improvement turf banks. The number of farmstead sites in such a small area from different farming eras demonstrates the continued use of this site over a long period for cultivation and sheep grazing. 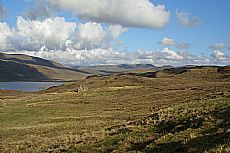 This area around Sandwood Bay is now viewed as an isolated location, over 4km from Blairmore, the nearest modern settlement. However, there is evidence of this area being settled from as early as the Mesolithic (Middle Stone Age, c.8000 – 4000 BC) in the form of a nearby shell midden located in the sand dunes. Bronze Age (c.2400 – 500BC) pottery has also been found and identified from the shore of Sandwood Loch. There is a possible dun, or Iron Age (c.550BC-560 AD) homestead on the opposite side of the bay, perhaps indicating the earliest permanent settlement in the area. Sandwood House is merely the latest evidence of human settlement in the area. The John Muir Trust owns the Sandwood Estate and plays an active part in preserving the landscape and heritage of the area, encouraging archaeological work such as the ACFA survey this information has been derived from. 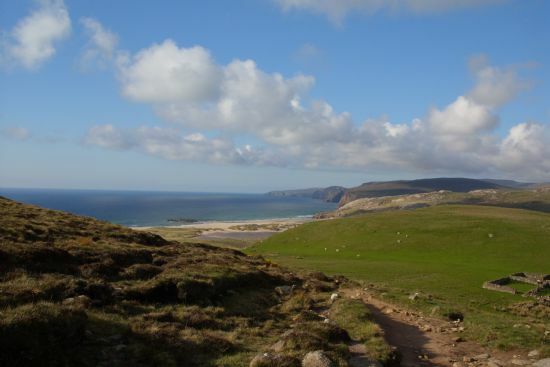 A modern, well-built path provides access to the site and the Bay itself, it is well worth a visit.